The Destiny video game -- out September 9 -- is called the world's most expensive video game, with Activision predicting it will become its next billion-dollar franchise. Now, the video game developer is spending money to make sure it makes money from this game. Company executives are budgeting some $500 million to promote this title, which includes traditional and viral initiatives. Thus far, the campaign has included a live-action commercial by "Iron Man" director Jon Favreau, a Beta game prototype played by 4.6 million people, the first selfie sent into deep space, the first Newsweek special-edition for a commercial product, gameplay trailers exploring Mars, Venus and the Moon, and Destiny Planet View, a chance to walk through these worlds using Google Street View -- the first time a video game has been mapped using Google technologies. Finally, to introduce a mainstream audience to Destiny, MDC Partners creative agency 72andSunny has created a cinematic 2:00 live-action trailer that illustrates the game's concept of planet-hopping adventures. "The live action trailer is the culmination of an ambitious marketing campaign befitting what we hope is our next blockbuster franchise," says Tim Ellis, chief marketing officer of Activision. Ellis added that filmmaker Joseph Kosinski (Tron: Legacy, Oblivion) has “channeled the epic look and feel of the game by shooting in locations here on Earth that mirror iconic interplanetary destinations in the game. The result is a story that captures the action, adventure, fun and exploration of the game itself." Notably, the trailer features the 'Immigrant Song' by Led Zeppelin, a band notorious for rarely letting any of its music get licensed, let alone what's arguably its most famous and iconic track, say executives. Actor Peter Dinklage (Game of Thrones and X-Men: Days of Future Past) voices the Ghost character in the trailer and plays the same character in the game. A 90-second version of this trailer debuted September 4th during NBC's season opener football game featuring the Seahawks vs. Packers. The long-form trailer can be seen here. 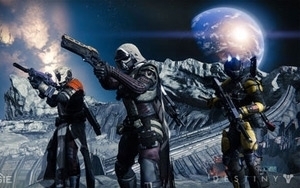 Destiny was developed by Activision and Bungle, the creators of Halo. The next-generation first-person shooter lets gamers personalize and upgrade with a nearly limitless combination of armor, weapons, and visual customizations. 1 comment about "You Gotta Spend It To Make It: Activision Earmarks $500 Million To Promote 'Destiny'". Brittney T from Not a company, September 8, 2014 at 1:31 a.m. This company has a lot of faith when Activision predicts their new video game “will become its next billion-dollar franchise.” Investing $500 million dollars for promotion for this game is very risky in my opinion. It is a video game, how much different can a videogame be? Most of them are similar with the same concepts and end goals. But this videogame actually is going to be the next highest grossing game; they have a lot of differentiation points that really is unlike any other video game. I thought it was amazing that they used Google street views in the game. What I find interesting is how much investment with other companies they put in like Bungie. In a marketing campaign Bungie released a beta test for Destiny, a pre-trial of what the final product is going to be like. Videogames companies do this to test at their servers, product, and customers. This is a great way to test market as well as advertise. It is also a good campaign to get users excited to actually purchase the game and tell their friends about it as well. Destiny broke a world record with a beta testing with over 4.5 million downloads of the game. Based on the testers they are projected total market is equivalent to over 15 million copies sold. The $500 million invested into this campaign really has results. I am a light user of playing videogames, and after all the hype and ads I’ve seen on this game, I really am interested in purchasing a copy.